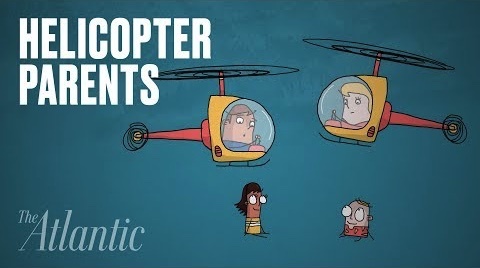 Helicopter Parenting: Are You Flying In Restricted Air Space? An associate psychology professor at the University of Mary Washington in Virginia, Holly Schiffrin, argues that “this type of involvement robs children of important lessons.” Most assume that the behavior is only found in middle to upper class parents, but researches at the University of Texas at Austin found that all income levels, ethnicities and genders are represented in the phenomenon (Almendrala). Although the definition of what it exactly means to be a helicopter parent is still being recognized, “scientists claim the effects of overprotective and neurotic parenting are becoming clear in the newest generation of adults” (Almendrala). 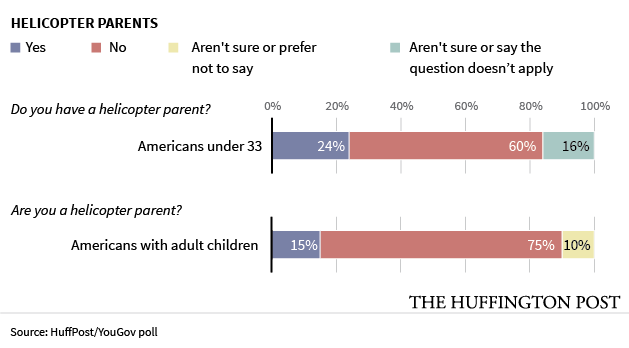 Huffington Post conducted an online survey in collaboration with YouGov. This graph shows that the divide, 24% of students saying they have helicopter parents, and 15% of parents saying they are not helicopter parents, suggests that “one person’s loving guidance is another person’s overbearing supervision – and that could be generational” (Almendral). So, helicopter parents out there, speaking from the viewpoint of a college student, your help is very much appreciated and us students understand your intentions, but you need to allow us to experience things and learn from them on our own. We will be better well-rounded people for it. 1. You are not a helicopter parent if you are worried when your child in college is sick. 2. You are not a helicopter parent if you are trying to help a desperately unhappy new freshman through this rough patch. 3. You are not a helicopter parent if you do your teen’s laundry, make them a meal, run an errand for them or do any number of things (at times) that you know they are perfectly capable of doing for themselves. 4. You are not a helicopter parent if you remind your high school student that they are making decisions now that will impact their future. 5. You are not a helicopter parent if you help your kid, support your kid, offer encouragement and, at times, let them dump their emotional trash on you.